Known as the most efficient image format, HEIC/HEIF is widely used among iOS users, which comes with better quality, compared to JPG, and takes up less storage space. This significant advantage is appreciated by some users who save the image in this particular format at own will. However, there are other users who want to convert these HEIC photos into more compatible JPGs. For all, losing valuable HEIC images is a horrible thing. Hence, in this article, we are going to show a 2-in-one solution to troubleshoot how to recover HEIC photos on iPhone and convert HEIC to JPG problems, to delight all iPhone HEIC users. 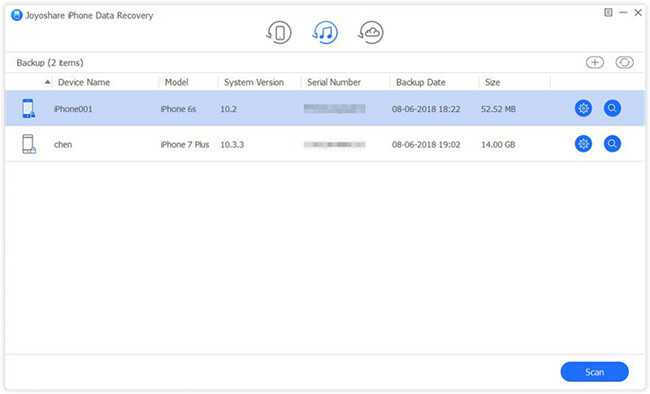 Joyoshare iPhone Data Recovery is a typical iOS HEIC photo recovery tool used to help Apple users recover deleted HEIC images from iPhone, iPad and iPod touch, or from iTunes and iCloud backups. Notably, developed with built-in HEIC converter, this brilliant program can do a good job to convert HEIC to JPG as long as you confirm your preferences in advance. 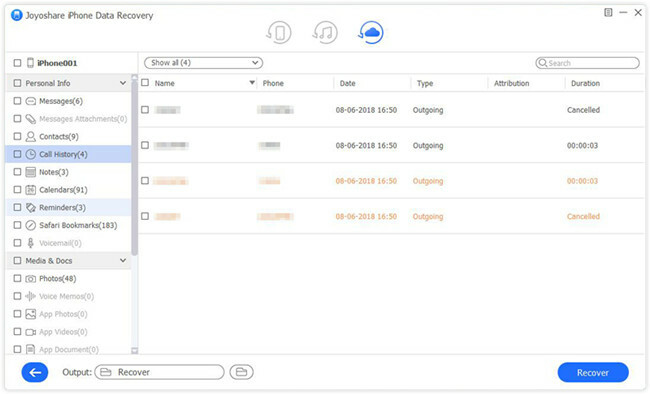 More than that, Joyoshare iPhone Data Recovery can even have high efficiency in retrieving other popular and important data types, such as videos, contacts, call history, reminders, notes, Safari bookmarks, WhatsApp/Viber/Kik messages, etc. With only few clicks, all selected recoverable files will be scanned and analyzed at super-fast speed with little disk space used. Besides, this professional tool also entitles you to preview found items in real time and choose them in selective manner. You can make the most of Joyoshare iPhone Data Recovery to recover whatever HEIC photos you need. It can support a wide range of iOS (iPhone/iPad/iPod touch) models, from the newest iPhone XS/XS Max/XR to the oldest iPhone 4, meanwhile including all series of iPad and iPod touch. Here's how to get your lost HEIC images off iPhone on the condition that there is no backup. Simply launch the installed Joyoshare iPhone Data Recovery on your desktop and go to its top right corner to click "Menu" > "Preferences" > "Recover". Scroll through to find "Recover Photos" option, with which you can "Convert HEIC to JPG" in the way you like. As per actual needs, you can decide whether to tick it or not. Step 2 Connect iPhone under "Recover from iDevice"
As instructed, you are supposed to connect your iPhone to the computer with an original USB cable under "Recover from iDevice" mode. Remember to "Trust" computer on this iOS device so that Joyoshare can detect and recognize it without hassle. Joyoshare will show iPhone device info on the left and supported data types on the right. Tick data files you would like to recover later, for example, "Photos", "App Photos", etc. 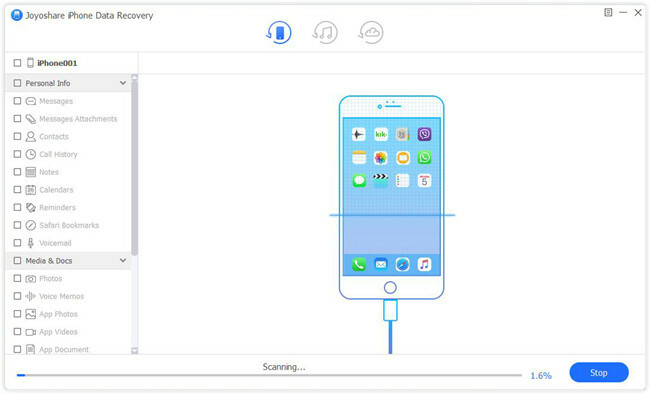 Then go to press "Scan" to start to scan iPhone data. After the scanning process, Joyoshare will bring not only the deleted but also the existing data for you to choose. You can filter out useless files by using "Only show the deleted" option. 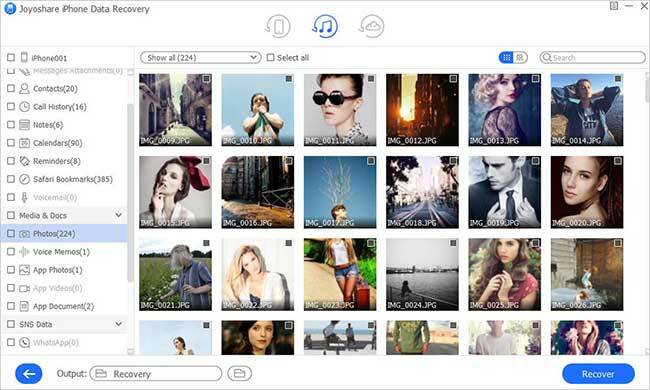 Hereafter, go to look through your HEIC pictures one by one; you have right to only select what you want and click "Recover" button to export them. The one who sets "Convert HEIC to JPG" on preferences can get JPGs on destination folder. 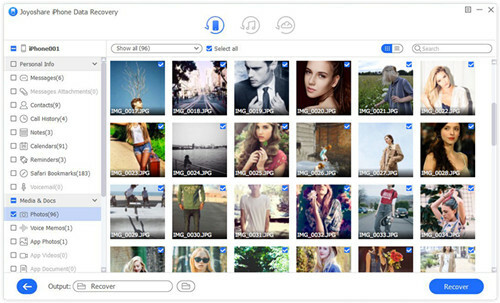 If you have backed up your iPhone data files, HEIC photos included, to iTunes before data loss, you are allowed to use Joyoshare to restore them without damaging and overwriting current files. Check out following guide here. 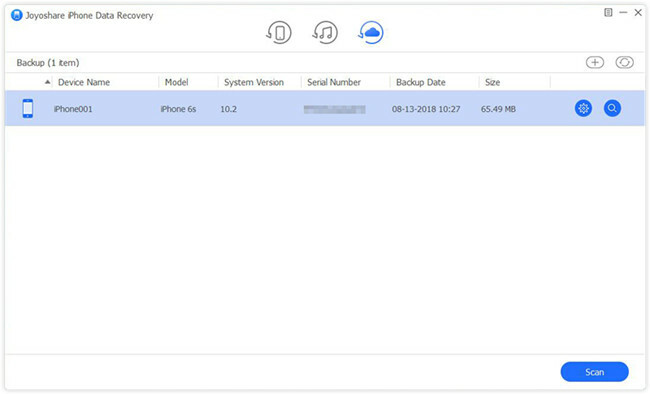 Open Joyoshare iPhone Data Recovery on your computer similarly. This time you ought to change recovery mode to "Recover from iTunes" on the top navigation bar. This iPhone iTunes backup extractor can detect and show all your previously created iTunes backups in a list. Select the most relevant one and hit the "gear" icon behind it to choose needed data types. 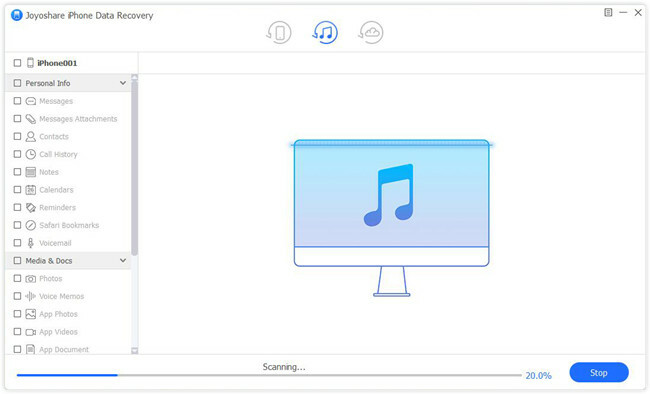 Continue to click "Scan" button to start to fetch iTunes backup data. It will take you a while to finish scanning iTunes backup. Soon after, all recoverable contents will be classified into different categories. Preview photos in the way you like and selectively tick the checkbox. Having confirmed all your desired items, you can tap on "Recover" button at the right bottom. It's likely that you have synced iPhone data to iCloud as well. In this case, another chance works for you too. Let's read over completed details below right now. 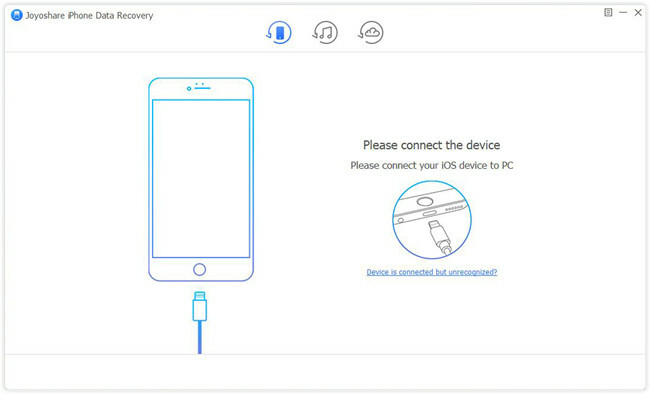 Likewise, simply run Joyoshare iPhone Data Recovery. 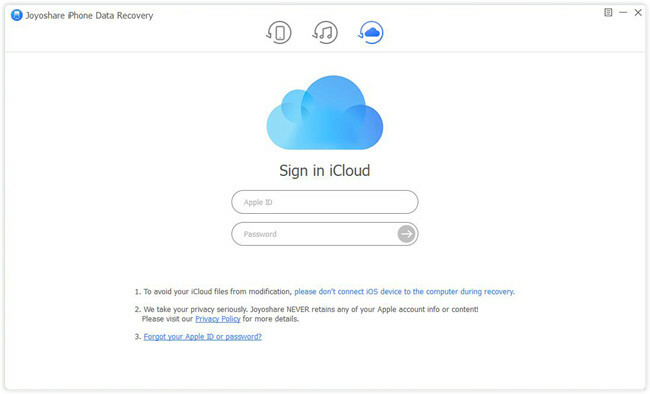 Switch recovery mode as "Recover from iCloud" and go forward to sign in your iCloud account, after which you will be asked to enter a random code that is received by your iOS device or computer. No worries. Joyoshare will not record any content or privacy. All synced iCloud backups can be displayed orderly. Download the one that may contain your deleted HEIC images and mark data types at the same time. After that, head to press "Scan" button to begin to scan what you need. You are allowed to check all results one after another once Joyoshare ends its scanning process. 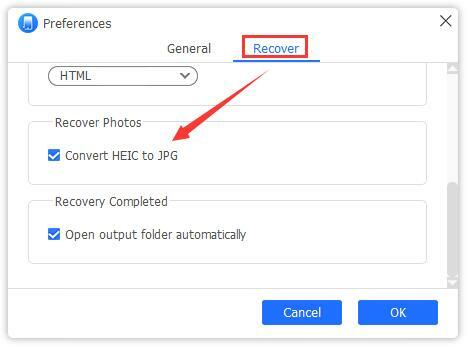 Pick up your important HEIC photos and click on "Recover" button to output them locally. Photos Disappeared After iOS 12 Update?